Asia Pulp & Paper (APP) has been accused of a “double default” on international creditors, after an investigation revealed that the company has decimated tropical forests it promised to conserve under “legally binding” debt restructuring agreements. APP Default on Environmental Covenant, a new report from Sumatra NGO coalition Eyes on the Forest, shows that the company in 2004 agreed to protect high conservation value forest under debt restructuring agreements it made with taxpayer-backed financial institutions in nine countries. The debt restructuring agreements were negotiated after APP in 2001 defaulted on a massive $US13.9 billion of debt and was delisted by the New York and Singapore stock exchanges. Asia Pulp & Paper (APP) claims of independent sustainability certification for its operations aren’t supported by the certification schemes and assessors it has nominated, a WWF survey has found. None of these certifications cover the most controversial operations of the APP’s wood suppliers – mass clearing of native forests which are home to critically endangered tigers, elephants and orang-utans and clearing and drainage of peat areas which result in massive greenhouse gas emissions. The certification schemes cited by APP cover some, but far from all, supplier timber plantations – but none considered whether plantation establishment involved the clearing of high conservation value forest or whether traditional forest owners had given their “free, prior and informed consent” to forest clearance or plantation establishment. Another blow to APP global greenwash campaign “None of the certifiers are prepared to back APP’s claim that their certifications demonstrate its sustainability. This is another blow to the credibility of APP’s massive global greenwash campaign,” said WWF International forest programme director Rod Taylor. On a weekend APP announcement that they would implement measures to ensure US consumers did not have to choose between tigers and toilet paper, Taylor said the company had a long record of broken promises and he would wait for actual evidence of a company halt to natural forest clearing. “No amount of public relations can change the fact that APP has bulldozed through their own 2004, 2007 and 2009 deadlines to stop feeding Sumatra’s natural forests through its pulp mills. WWF asked the nominated certification schemes and assessors whether they supported the APP claim and also asked for detail of what specific APP products or operations were covered by their certifications. The survey covered the key social and environmental measures of free prior and informed consent by landowners and protection of high conservation value forests for forest operations and forest clearance for plantations. None of the schemes or assessors endorsed the APP statement, with major certifier SGS noting that “None of the TLTV (legality) evaluations conducted by SGS and the statements issued by SGS provide the company with the right to claim that their operations are ‘sustainable forest management’ ” and “The SGS certificates/statements do not support the claim of ‘sustainability’.” No certificate or assessment issued evaluated the sustainability of the APP group as a whole. The PEFC CoC certificates they hold also do not provide any assurance of their own sustainability since these are simply chain of custody and nothing more,” said SGS which conducts the PEFC certifications. “The PEFC certified material they use in their production, thus enabling them to make PEFC certification claims, is all imported from outside Indonesia as by our understanding there are no PEFC certified forests in Indonesia.” Key but neglected dimensions of sustainability were whether conversion to plantation involved the clearing of High Conservation Value (HCV) forest or whether those with traditional forest rights or tenure had given their “free, prior and informed consent” to the conversions. The LEI standard, for example confirmed that "The decision to establish forest plantation in certain area, either it was converting natural forest with HCV forest or deep peat and how it was conducted in relation to Free, Prior and Informed Consent is beyond LEI’s standard coverage." APP suppliers have a record of clearing areas of HCV forest and of neglecting to recognise or do rigorous HCV assessments. The WWF survey found that none of the certifications demonstrated the legality of the APP wood supply as a whole. Additionally, SGS noted that some plantations had been established on deep peat (more than three metres deep) but Indonesian law lacked clear definition of the conditions under which this was prohibited. As well as being legally contentious, clearing and drainage of deep peats is a key factor in elevating Indonesia to the leading ranks of carbon emitters globally and opens coastal areas to the risk of seawater incursions. Sumatra has lost more than half of its native forests in the last 25 years. The International Union for the Conservation of Nature recently upgraded the Red List of threatened species status of the Sumatra elephant to “critically endangered”, citing habitat loss as the main reason. "Zero tolerance for illegal wood" says APP policy. But a yearlong investigation by Greenpeace uncovered that APP is systematically violating Indonesia’s laws which protect ramin, an internationally protected tree species under the CITES treaty. Ramin trees come from Indonesia’s peat swamp forests which are also home to the endangered Sumatran tiger. 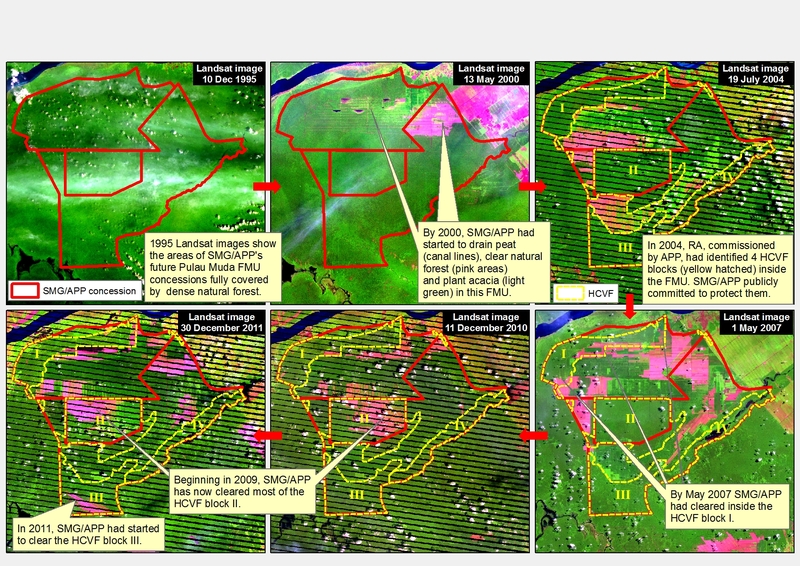 According to Greenpeace mapping analysis, since 2001, at least 180,000 hectares of peat swamp forest – an area twice the size of New York City have been cleared in concessions now controlled by APP. Is it any wonder there are only 400 Sumatran tigers left in the wild? Numerous visits were made to APP’s largest pulp mill in Indonesia over the course of last year. Hidden among other rainforest species waiting to be pulped were numerous illegal ramin logs. To prove these trees were ramin, samples were taken and sent to an independent expert lab in Germany. The lab confirmed that all of these samples were indeed ramin. As well as finding APP in possession of illegal ramin, Greenpeace tracked where APP’s pulp and paper is going and found a trail that leads to major global names such as Xerox, National Geographic and Danone. Greenpeace tested the fibres of many of these products, and found they contained rainforest fibre. "Not only is APP undermining the rule of law in Indonesia it is also implicating some of its biggest customers in this rainforest scandal. The likes of Xerox and Danone must now follow in the footsteps of other major names like Mattel, Nestle and Adidas who have already suspended all purchases from APP". says Greenpeace. In Jakarta, Greenpeace Indonesia will be handing the video footage to the Police and is urging the Ministry of Forestry and CITES authorities to immediately seize all illegal ramin in APP’s operations and work together to end the trade in ramin from Indonesia’s peat swamp forests.